My Magazine delivers news update to your Galaxy S5 screen. It works similar to Flipboard app or Blinkfeed in HTC devices. Some S5 owners like this app for its convenience; some don’t due to lack of customization. A few Galaxy S5 owners also reported the resource hogging of this app. Sometimes, it is annoying when you accidently move the home screen to this app. In addition, if My Magazine is enabled in Galaxy S5 screen, you cannot “rotate” the home screens, in other words, when you flick to the last home screen page, you cannot continue to flick the the first. If you don’t like My Magazine, or if you don’t want it in the home screen, you can easily turn it off. How to remove My Magazine from Galaxy S5 home screen? Stop 1: in your home screen, tap and hold any blank area until the home screen enters editing mode. Step 2: tap “Home screen settings” as shown below. Step 3: uncheck My Magazine in home screen settings as shown above. That’s all. My Magazine now is removed from your Galaxy S5 home screen. Please note, this only removes the app from the home screen. The app is still running in background. 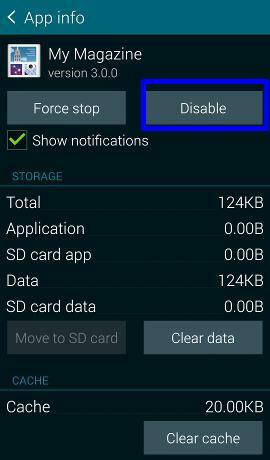 If you want to disable My Magazine completely from your Galaxy S5, please read on. 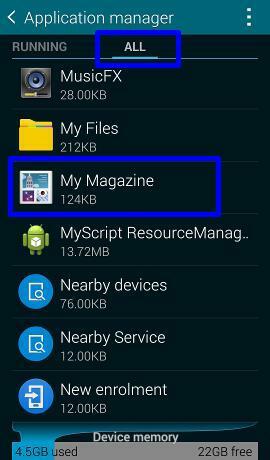 How to disable My Magazine in Galaxy S5? If you son’t want to use My Magazine on Galaxy S5, it is better to disable it completely. 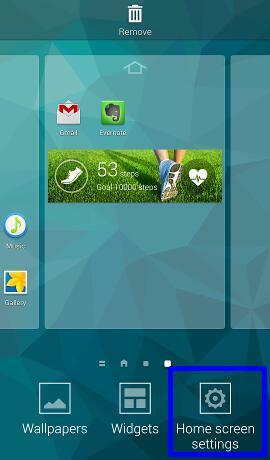 Because My Magazine on Galaxy S5 is a pre-installed (pre-loaded) app, your Galaxy S5 treats it as a system app. So, you cannot remove it from your Galaxy S5 unless you root your S5. But you can disable it. Step 2: Flick right to “All”. Scroll down to locate My Magazine. Tap it, as shown below. Step 3: in the app info page for My Magazine, tap “Disable” as shown above. In some regions, it may be “Turn off”. Step 4: in a pop out window, you will get a warning message on disabling pre-installed apps, such as My Magazine. Tap OK to acknowledge the warning as shown below. Once the My Magazine app is disabled, the app info page will have a button of “enable”. 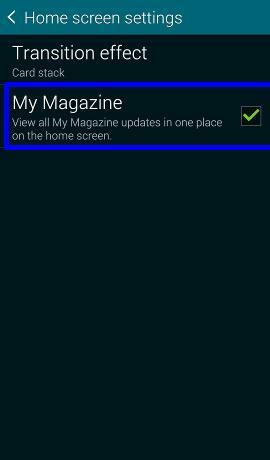 You can use this button if you want to re-activate the My Magazine in your Galaxy S5. Now. 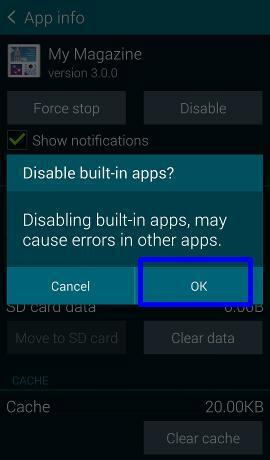 My Magazine is disabled in your Galaxy S5, although the installation files are still in your S5. You cannot remove these files unless your S5 is rooted. Leaving these files in your S5wil not consume phone resources except the small storage space. Do you have any questions on removing My Magazine from home screen or disabling My Magazine in Galaxy S5? If you still have questions or encounter any problems when removing My Magazine from home screen or disabling My Magazine in Galaxy S5, please let us know in the comment box below. More how-to guides , tips and tricks for using Samsung Galaxy S5 are available at Samsung Galaxy S5 how-to guides page. Following you guidelines to disable My Magazine. When I went to Application Manager, My Magazines was not there. Could not disable it. Might need more detail instructions. I have the S5. Thank you. There are different tabs in Application manager, the default is Downloaded, you need scroll to right to “ALL” as shown in the post. Then, you can find the app. Some carriers asked Samsung to remove it. You can install Flipboard app if you need it. Actually, Google Now launcher has a better solution with Google Now page in the leftmost page. When I go to the My Magazine app on my Galaxy S5 “Turn Off” is grayed out and not able to be selected. I have turned it off from the home screen, swiping left doesn’t bring it up anymore but the app still runs because if I “Force Stop” it within 10 minutes or so “Force Stop” is available again. Any ideas? I have been all over the web an everyone seems to find “Turn Off” available but it is not for me. if you can find Flipboard in your phone, you can disable (or uninstall) it first. (you an enable it later). Another thing you can try is to reboot the phone to see whether it is still grayed out. What version of “My Magazine” does your phone have? Mine says 3.0.0. Alright I removed Flipboard. I powered off my phone, took out the battery, put in the battery, and powered it back up again but “My Magazine” still has “Turn Off” grayed out I can force stop it and delete database and cache but within a few hours I will need to turn it off again and it has about 105KB worth of database and cache, not much but still shows it is doing something. I’ve scoured google but am only finding people that can turn it off, no one seems to have trouble with turn it off being unavailable. My phone is running what it came with no modifications or additional apps installed yet. All s5 should have 3.0.x. Anyway, after removing it from home screen, it should use much resources. Then you probably cannot turn it off. The carrier can mark any apps as essential so that you cannot turn it off. I have the S5 active. Turned off Flipboard and uninstalled updates and still couldn’t turn off My Magazine. It was still grayed out. When I reboot the phone it turns Flipboard back on and re installs updates automatically. Any idea how to turn them both off because I will never use them. Thanks. If it is greyed out, then you probably cannot disable it. Very likely, it’s hooked somewhere to the system service. This probably depends on the firmware for different regions because in some regions this can be disabled. Same problem but thank you. It did take it off my home screen. I have the S5 Active; My version 3.0.0 My Magazine “Turn Off” button is grayed out too. I cleared the cache and rebooted and it came back with 12KB in the cache from boot. I assume it is hooked to start-up because I never acknowledged the opt-in policies from the setup screen before I deleted it from my home screen and tried to disable. maybe due to that fact that the firmware in different regions is slightly different. after clicking disable it says this app will be replaced with factory version. What does this mean? It has a button that says unis tall up dates. What will this option do? This is normal. For a pre-installed app, before disabling it, you must uninstall any updates for it so that it can be reverted to the “original” state. The factory setting is just for this app, not other apps. I have…. My Magazine 3.0 . My magazine is a background data hog. It’s burns the most Data every month. It is a menace and Samsung keeps it running even when you turn it off. For some reason my photos automatically save to my phone and not the 16g card I have in it. Is there any way to save the pics that are on the phone to the memory card and have them all go straight to the card in the future. Open camera app, tap the gear button, in the second page (you need scroll down) to find the Storage location. Choose Memory card. All future photos and videos will be saved to SD card, instead of the internal storage. For existing photos, you can use My Files or Gallery app to manually move them to SD card if you want. Omg thanks so much I hated that feature, so much better without it! Thank You for the help I just got a galaxy S5 latest model and this my magazine crap was gettin on my last nerve. I tried going in and force stopping it and i tried the other way that led me to see YOUR solution AND it WORKS! i even rebooted it yes turned it COMPLETELY OFF then turned it on again and it’s GONE! one day i wanna become a TROUBLE techy like you and learn how to get rid of unnecessary crap like this too … again THANK YOU! Thank you! I know this is an older phone but am using it as a hand me down for the first time… nice to see this worked. A few other places didn’t have the correct info. Thanks for taking the time to share info that’s helpful to others!